While much of the rest of the country was chasing the eclipse, I was chasing flower flies. I didn’t know they were flower flies at the time. All I know is I was minding my own business, writing away, when I heard a gentle buzzing. Not the angry buzzing of a bee. But a more inquisitive buzzing, like a frustrated question. Looking up, I saw not one but two insects that resembled small bees on the screen, trying to get out of the window to the fresh air beyond. I ran my eyes over the window frame, looking for how they got in. Not seeing any obvious point of entry, I went back to work, hoping the little bees or whatever they were would be so busy trying to escape they’d leave me alone. Shortly after, I decided it was time for lunch. My flying guests were still trying to leave. I left them to it. I made a pair of salads and set them out on the table on the deck. Then I walked over to the window, to look in from the outside. My guests had brought friends. Lots of them. Twenty or more yellow and black insects were crawling on the screen and along the sides of the window frame, or flying up and down. Distressed, I summoned Long Suffering Husband. He shut the window, trapping the bees between the glass and the frame. He didn’t see how they got in, either. More hungry than concerned, we sat down to eat. It was a cloudy day; the sun playing hide and seek with the lake and trees. Then we noticed the light dimming, somehow becoming less clear. Light I would expect when a fierce storm brews and the clouds turn black. The wind dropped and the air went still, as if the very wind was holding its breath as the moon passed over the sun. Our area was only in the 70% zone, so we hadn’t expected much. The eerie stillness and noticeable dimming of the light made us marvel at the world we live in. “What if the moon gets stuck there?” Husband asked. We debated that one, how it would even be possible, using an orange as a model of the earth. Our conclusion? It sure would mess up the tides. Husband went inside to deal with the bees, pulling his hood over his head and arming himself with a dish towel. I glanced up and was rewarded with a glimpse of the sun, partially covered by a black disk. Yes, I looked at the eclipse without eye protection. I know, not smart. But in my defense, I looked up, not expecting to see anything but clouds. And I only looked for a second. Then I raced inside to interrupt the bee massacre. Husband came outside to look, but by then the clouds had covered the sun again. We returned the scene of the carnage, where twenty or more bees had met their end. Then Husband went on a search. He found a small hole in the ceiling and caught one of the little critters wriggling through. A little duct tape provided a partial solution, just as we noticed the bright sunshine of a typical day. So much for the eclipse. We’d solved one mystery (how the flying insects got in) but not the other. Why didn’t these bees sting when attacked? A few minutes with my best friend Google and I had the answer. 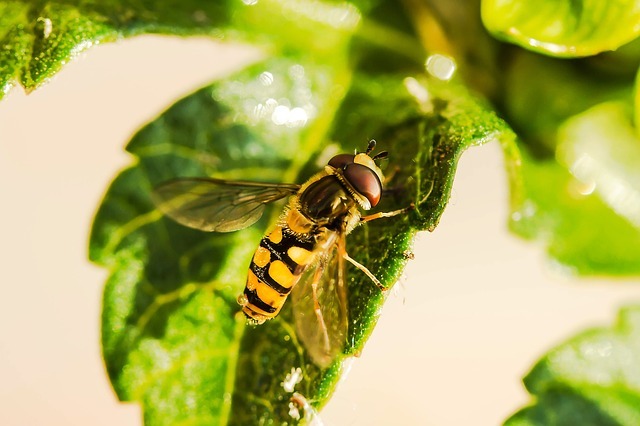 They are really flower flies, sometimes called hover flies. They act like bees, helping to pollinate flowers, but don’t sting. I still don’t want them in my house. Would you? The eclipse is over. The flower fly invasion is over, at least temporarily. Now Husband has a new task: to climb up into the attic and find a total solution to the problem. And I can get back to work.